Scottscope: The Rock Gets Back To Business With "Faster"
The Rock Gets Back To Business With "Faster"
Once upon a time it seemed as though Dwayne "The Rock" Johnson was poised to become the next big action action star. A cameo from Arnold Shwarzenegger in The Rundown seemed to signify a changing of the guard. Alas, that brand of machine gun toting superman had already fallen well out of favor by that point. As a result, Johnson's career took a decidedly different path. 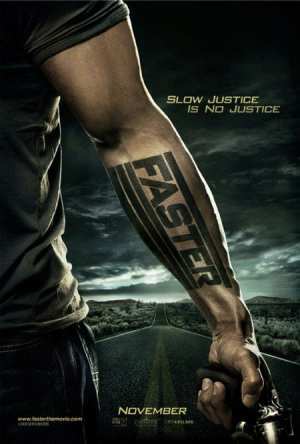 The upcoming Faster looks to set him squarely back on course. Johnson plays Driver, an ex-con out to avenge the death of his brother after the two were double crossed during a hiest. Billy Bob Thornton plays a veteran police officer who shadows his every move. Tom Berenger is also listed among the cast. George Tillman, JR., who dramatized the life and career of rap icon The Notorious B.I.G with last years Notorious, is directing. The trailer establishes a sense of comfort and familiarity right from the outset. The iconic gunslinger imagery effectively sells the film as a modern day western. The accompanying "sermon" and bluesy electric guitar that underscore the images add considerably to the ambiance . The Rock seems right at home, as does Billy Bob Thornton. This is clearly a meat and potatoes action film, designed for viewers who appreciate the genre in it's purist form.